"After studying tourism in school for three years, I have worked as a travel professional for almost a decade. Hola! 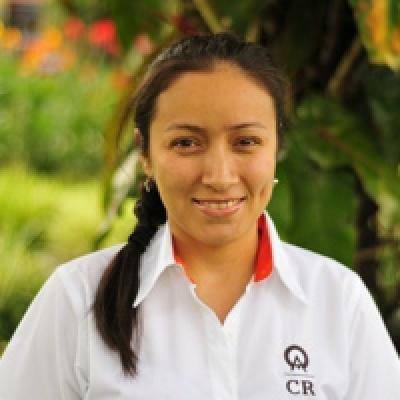 I'm Yahaira, and having worked for hotels, adventure companies, and travel agencies, I can easily say that what I like best about my job is that I get to help people create beautiful memories. It's so nice to have people tell you that they had a great time in Costa Rica. I spend so much time getting to know the people I'm helping that some of my clients even come by the office to say, ""Hi!"" or ""Thank you!"" I've had clients return to Costa Rica several years in a row, and it's a treat to be able to work with them year after year — planning new adventures. I live in La Fortuna and love nature, but I'm privileged to have visited many beautiful destinations in Costa Rica. My favorite parks are Chirripoó National Park, and Corcovado National Park. My family — which includes a very active son — loves getting outdoors, and my mother (a wonderful cook) and I usually meet once a week to make different meals. I can recommend some great cooking classes for you to learn how to make gallo pinto, olla de carne, and tamales — just like we do! We live 'Pura Vida,' and with the right vacation, you can too!" Great experience from start to finish. Thank you for all your help and planning. It made my trip to Costa Rica so much more relaxing. Keep up the good work!! Me and Allen were extremely pleased with the company, and the holiday was above our expectations. Thanks SO much for all your kind help and advise!! You were amazing. Thank you. Trip of a lifetime! You were amazing and we loved every second. Thank you for making such great recommendations! Yahaira, you were so wonderful to work with! Thank you for everything!! Great company, it was an amazing trip and the service was outstanding! We had a great trip. Yahaira and the other Anywhere folks were a real pleasure to work with, and the one time we complained about something, she had a solution almost immediately. I would definitely recommend Anywhere to friends. Yahaira was great to work with. She put together the perfect itinerary for me and my boyfriend. We had the perfect trip! Thank you, Yahaira! Yahaira has been very helpful throughout the planning. Highly responsive. Would choose her again. She was very responsive and planned a very well organized visit. Thank you ! You were amazing and so helpful! Thank you so much for your tips, kindness in allowing us to park at your office while in La Fortuna and your incredible responsiveness rate. I hope you enjoy a wonderful day in beautiful Costa Rica! Yaharia and the other staff were more than helpful, they were excellent with communication and responsiveness and made us feel safe. Thank you again. Thanks for your help arranging a wonderful trip. Yahaira was so great! She made everything so easy for me to plan for my group - a group of 6 co-workers traveling with me. So grateful for all her help. So glad I was able to meet you Yahaira. Thank you for giving us a memorable trip! We had a great time!!! Yahaira was a consummate professional! Patient, attentive and made sure she matched us to the best experience, budget and plan!! You did a great job! I really liked how you kept recommending different hotels. And all the tours that you booked were awesome. Thanks! Accommodating, friendly, professional and knowledgeable! Everything positive you look for in someone who is helping plan your vacation Yahaira had it. Thankyou for all your help and attention to detail!